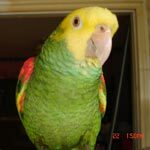 Parrot Forum • View topic - how to grab your parrot? how to grab your parrot? Exchange information about how to teach specific tricks to parrots. Most of these techniques should apply to all bird species. Share your success stories. I recently purchased a indiana ringneck, he is 5 months old, i´ve had him for about 4 weeks already he loves to be on my shoulder or on my finger he steps up on command he really likes me and i like him. But every time i try to grab him by the neck just like the parrot wizard showed it in his videos he will bite me or hold on and wont let go of my finger that he´s standing on pls someone help me? Re: how to grab your parrot? I have an indian ringneck of an undetermined age (adopted), and I personally would not recommend picking up any bird by their neck. What will you gain by doing that? Just have him step up. Well you have to train the parrot to accept that. You shouldn't just grab a frantic/biting bird like that. I do not know if this link will work here or not but if it does let me know and also let me know if it helps you out. I have a flock of rescue Cockatiels. Some are handicapped and all came very afraid. Because there are so many and all I want for them is to be happy I rarely single one out. I don't ask for step ups. If they do not do it on their own then I use the "scoop" method of two hands scooped under the bird. Most accept it the first time I try it but some are severely handicapped by one of their prior humans and terrified. The last rescue is Gimpy, a little guy who chewed off his own leg when it was infected and his human did not take him to the vet. I have used scoop on him many times since he could not walk and his humans had clipped his wings. He was even afraid of that but yesterday he accepted help without fear. So to shorten what I posted: those who won't step up will usually accept scoop up. I would never pick up a bird from above it. It has nothing to do with age or species and everything to do with the proper training. My birds were extensively trained to accept being grabbed for so long that it has become second nature and fun to them. I haven't given any treats for it in years but they still like to play like this. This is extremely useful in the utility it provides when harnessing, grooming, or vetting these birds. They are prepared and not traumatized by any form of handling. However, they were taught to tolerate, accept, and enjoy being handled through treats and training initially. I explain this process in depth in my book. I still can't see any purpose for it. Predators come from above and attack at the neck. Why make them accept it when their are other methods. I have not tried this with any of my birds, but can see some pros and cons to it. Mostly, I view it in much the same manner as I view toweling. Like toweling it can be misused and it can be traumatic to the bird that has not been taught to relax and accept it. Un fortunately we all should learn the proper way to restrain our birds and then do it at least enough for them to relax and trust us when we must use it. It does not have to be a bad thing, it is just another tool. liz wrote: I still can't see any purpose for it. Predators come from above and attack at the neck. Why make them accept it when their are other methods. Because then there is no reason for the bird to ever get scared of us. If we use taming/training to teach the bird to be cool with even the scariest (but safe/reasonable) things we can possibly do to them intentionally or not, then there is no fear or biting response from the bird.